I met some truly awesome people at the Summit of Awesome (with a title like that, how could you not?). I owe you all a post about all the inspiring ideas it exposed me to, but for now, I want to talk a little about a chat I had with Liz and Jeff about--none other than--weddings. Liz and Jeff run a neat little site called cosa verde, which is a marketplace for eco-conscious crafts. They also happen to be planning and wedding, and we talked [briefly] about the deep stuff of weddings, like the question: What do you do if you don't want to be the center of attention at your own wedding? I didn't have time to adequately think through all my ideas with them, so I wanted to take a few minutes to ruminate the idea here. Weddings inherently put the two partners-to-be center stage. Even if you get married at a courthouse, you are still the object of attention (although to a markedly lesser degree). I'm kind of an odd bird. I have habits that put me in the center of attention (like wearing clown costumes and Scrabble costumes and doing random acts of kindness around town and wearing a 1950s party dress to weddings and out to dinner), but then I'm uncomfortable when I'm there. I like to dance like a crazy fool (like at the Peter Bjorn and John concert in DC on Saturday!) but not because I want people to look at me. I do it because I like the way it feels (despite the fact that it may draw attention my way). Some people look forward to being the center of attention on their wedding day. They want to bask in the loving attention of their friends and family. They look forward to their walk down the aisle, for example. We didn't walk down the aisle: First of all, there wasn't really an aisle to walk down. I worried about it for a few seconds ("Maybe we can rent a nearby cabin, hide out in it, and then walk down the "aisle" to start the wedding?") And then I realized, "Wait a second. I don't actually want to walk down an aisle. I'll already be nervous about speaking in front of everybody; I would rather forgo the expected aisle altogether." We simply pulled up in our car, got out, and started mingling with our guests. I was nervous for about two seconds. Then I saw my good friend, Luis, and got overwhelmed with love and affection for him. I pretty much stopped being nervous. People were definitely staring at me and checking out my dress, but I was too busy talking with people to notice too much. We incorporated toasts into our ceremony instead of doing them during the reception: We love the sentiments of toasts, but we didn't want to stop our reception in the middle of the party and focus attention back on us. Therefore, we incorporated "toasts" into our ceremony. We asked five of our friends and family members to speak during the ceremony. People did the same thing they do during toasts: Tell funny stories, recite poems, read quotes, make wishes, etc. We used the "cake cutting" as an opportunity to thank our friends and family for helping out with the wedding, rather than drawing more attention to ourselves. We set up a reception with multiple activities going on simultaneously, so people could do their own thing instead of wait to see what we were doing. We had dancing on the patio, board games in the living room, hot-tub soaking, and roasting marshmallows around a campfire. We posted a sign with all the activities listed, so people had a sense of what options were available to them. 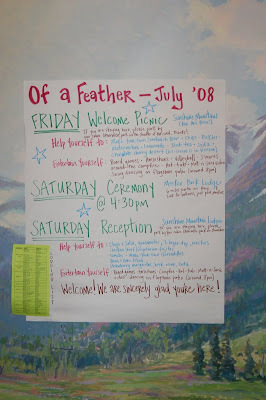 We encouraged our guests to get to know each other by having quirky name tags at the Welcome Picnic and an online guest book for them to upload their photos and a brief bio of themselves prior to the wedding. We limited our guest list to a smaller number of our nearest and dearest rather than a larger circle of acquaintances. I know it seems like we were major hams by doing a first dance, but honestly, it wasn't. I just love to dance, and I was so excited about the opportunity to choreograph something with my friends. This fact may shock you (it shocks everyone who knows me well): I was a cheerleader for eight years (from age 8-16). I didn't particularly crave or like the attention; I just really liked to practice routines (especially the dances) and perform them with a group! After my sophomore year, I couldn't stand the dynamics of high school cheer leading and decided to join the swim team instead. I appreciated the meditative aspects of long swim practices. But I digress. What other options exist for people who want to minimize the spotlight on their own wedding days? Have the ceremony in private and then party with your friends and family afterward. Forgo one large wedding and instead hold smaller receptions at different places around the country, depending on where you friends and family are concentrated. Skip things like the first dance, a bouquet toss, the garter thing--treat your wedding more like a regular party. What other ideas do you have for couples who don't like the spotlight? I love the cheerleader disclosure...I'm a closet cheerleader, too! 7th grade through 12th. The residual effects of that experience include excessive ongoing enthusiasm, which tends to rear its head in the form of an overly enthusiastic use of punctuation. I literally have to skim the emails I send so as to rein in any superfluous use of exclamation points, and I fully blame it on all those years as a cheerleader. When I get together with my extended family for events-- weddings, graduations, babies-- we all know that the events are pretty much just excuses to get together. I'm extending this line of thought to our wedding. Sure, people are coming to the wedding, but really, it's going to be a large get-together that happens to have a wedding. Thanks for this post. Both myself and my fiance hate being the centre of attention. I can cope with the aisle walk but we'd decided not to have a first dance or speeches/toast. Having toasts in ceremony is a great idea! Did you end up using some sort of sound amplification? This is something we're discussing for our outdoor wedding - on the one hand, we want people to be able to hear (and FH already speaks softly and doesn't project) but on the other hand, I don't want to have to worry about getting and setting up a lot of equipment. Hi Sara! It was so great to be able to meet you this weekend, even though we only got to have a brief chat. Thanks for the little shout-out! For us, the decision not to have a ceremony was two-fold. Partly (ok, very much) because I really do hate being the center of attention, but also because an official ceremony feels kind of redundant to me. We've been together 11 years, living together forever, built a business together—we feel like we've already been married for a long time! And our families have all been treating us as if we're married for years. So a wedding to me is more an excuse to make our relationship legally recognized, and then have a killer party, because we'd never be able to get away with just eloping. Hmmm... well neither my husband nor I enjoy being "center of attention" but I dislike it whereas he DETESTS it. In fact, when put in the center of a group, he gets so uncomfortable he just wants to leave the room. Not what we wanted for him on our wedding day! So... we planned a nice little brunch for after the ceremony where most people just munched and mingled and we could wander around among them without feeling like the "center" of anything. In fact, we hired someone to play a harp during the luncheon just so there would be a sort-of "focal point" for people to look towards when they didn't have anything else to look at... and it wasn't us. The result? I certainly never felt more peaceful (although admittedly I was in a crowd of all my favorite people, so I could have enjoyed if the luncheon lasted al week!) But best of all my husband didn't feel the least bit uncomfortable, either! It was the best kind of family/friend reunion. Thanks for addressing this issue, Sara! There are some great ideas here. It seems to be assumed that if you're having a wedding, you want to play princess and be the center of attention, but this has never been the case for me. For the longest time, I didn't want a wedding for this very reason. Now I see it is about more - joining the families, sharing the days with friends - and I am delighted to have these ideas for directing the attention around the whole group, rather than just on us. And, just for the record, there's a spectrum that ranges from don't-want-to-be-the-center-of-attention to I'm-a-pretty-pretty-princess-and-this-day-is-all-about-me. There are lots of extroverted people who don't mind being in the spotlight on their wedding days but still aren't narcissistic or self-absorbed. At a a wedding I recently heard about from a friend, the bride and groom said their vows to each other with no microphone while a song was played for the audience to enjoy. I really like this idea (and might use it in my own wedding) because family and friends still get to witness the union, but the actual words are private between the couple. And for me, that seems make it so much more meaningful. I can think about what I want HIM to hear, and not what the audience will think when I say my vows. What a concept! I agree with the anons on here. When I first started reading this blog I was excited because I thought it was a place where the value of a wedding was the relational part, and spending 30,000 was not the norm. But more and more it seems like its not a forum to enpower the budget minded, but to bash those of us who are still planning on encorporating traditional elements to our celebrations. I an not having a "traditional" wedding, but there are parts that are what people would term as normal. To me it seems like this type of post makes this blog look like a little clique of brides mad at the world because they dont find fufillment in centerpeices for example. Some of us know that that stuff doesn't really MATTER, but we're not going to make people who enjoy creating them feel inferior. If this is a sort of clique, I am glad for it! I have been an emotional wreck trying to plan our wedding, always second guessing myself. This is the first website that I have found that I can identify with and it has really helped affirm our decisions. I also think this website shows how it is possible to make even centerpieces meaningful. I think that is the biggest point of the wedding- how to make it meaningful. My mom is in charge of the reception flowers. She is going to the farmers market and we are going to put them in mason jars. We will have a lot of dahlias because they are special to Matt, and we will be supporting our local farmer's market. Mason jars are reusable and very affordable. I love that my mom has a specific job to be involved in. But if someone wants professional flowsers- THAT IS OKAY TOO. If you have always loved orchids or something, then that is what you should have. I just love how this website makes me feel like it is okay to make the decisions that we feel comfortable with. I hope that "anonymous" finds that, even if it isn't on this website. EmilyandMatt, I believe that was the perfect response. I'm not here to make those people who drop $30,000 (or who have a wedding coordinator, or anything else) feel bad, I'm here because there are so many places where I feel bad for NOT spending so much, and it's nice to have a place to chill. (Plus, I need the budget/DIY tips!) I like that this is a place for everyone to feel like what they're doing is ok.
Now, on to non-centre-of-attention ideas... I like the idea of having games (in my family it will be "corn hole" and/or water volleyball in the lake), and especially of making s'mores! I also think Sara and Matt's idea of having more than one thing going on at once was a good idea to get people interacting and enjoying one another. I think it can be hard sometimes having to avoiding being the center of attention when it comes to getting married. I myself am getting married in a church. I'm very dedicated to my religion and I love my church. The focus will be on my fiance and I when we do get married. I'm kind of used to walking up the isle anyways because I work with children at my church. When mass starts a group of church memembers and I all walk up the church together. Everytime, I walk up the isle at church I'm always holding a book. So I know what it feels like to be the center of attention. After, doing this for many years I've gotten so used to it. For my fiance and I, we won't really be able to avoid it at our wedding. At the reception, we can sort of avoid feeling like the attention is on us just by making little changes to our reception. I've gone to many weddings where the bride and groom are introduced along with their wedding party right when the reception starts. In my opinion, I just might forgo that idea. I might just have my bridal party and I walk into the hall and start mingling with my family and friends. We don't need a big announcement from the DJ to tell our family and friends who we really are. Most everyone will already know our names. Another idea would be to avoid the bridal toss and garter toss. I might do a bridal toss and a garter toss but I'm still on the fence about it. First, I want to learn more about those tradtions to see how important they are/aren't. If I don't feel they are that important, I will just forgo the idea all together. The bride and groom could also avoid doing a champange toast as well. Or if they do decided to do the toast, do it early on at the reception when everyone is mingling. Don't do it during dinner when all eyes are on the bride and grooom. Instead of having the bridal party sit together, they could sit with family and friends instead. The frist dance between the bride and the groom could actually be a group dance. Why not incorrporate family and friends to dance together? When couples have music at their wedding they could avoid getting a DJ or hiring a band and having to deal with the DJ always annoucing the fact the couple is married. If couples decides to get a DJ or hire a band, why not tell the person that you don't want to be the center of attention? That way they can avoid announcing the couples name so many times. Instead of having the wedding photographers just take pictures of the bride and groom, why not have the photographers take pictures of the family and friends who are at the wedding? I've been to many weddings where the photographer only took photos of the bride and groom. Why about the family and friends who attend the wedding? Why not take pictures of them too? Instead, of getting a real photographer, why not hire family and friends to take pictures at the wedding? That way, both couples aren't embrassed to have their photos taken by some stranger. When couples cut the cake they could avoid doing that. Why not have the cake already cut? So when dessert rolls around, the guest could get their own cake.